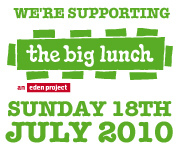 Home > Uncategorized	> The Big Lunch – nearly here. The Big Lunch – nearly here. Just a few days to go now before our big community event. Fingers crossed for fine sunny weather. Balloons & Bunting to be blown up and fixed on Saturday the 17th from 6pm – all help welcome. We are still short of raffle prizes so would be grateful for any offers – before – or on the day please. Ellerton Road will be closed for several hours during the Big Lunch from Dennan Road to Tolworth Park Road. And Bond Road will be closed at the same time from Ellerton Road to Tolworth Park Road. It would be appreciated if people could temporarily remove their cars from these sections before the Big Lunch. Buckets for donations towards the running costs of EBRRA will be ‘doing the rounds’ during the Big Lunch and any amount large or small will be gratefully accepted. This will be an informal event giving residents of Ellerton and Bond Road the chance to meet, share some time for a chat and to make new friends. The Flight Dance Group will be performing at 1 PM, then holding a 1/4 hour dance workshop followed by another performance. A jazz group will be providing music during the lunch. There will be a raffle with some great prizes. Face painting for children – with pre issued free vouchers – £4 for visiting children. Childrens ‘garden in a box’ competition – entries early please – ready for judging. A ‘street mystery prize’ – remember to bring your recently delivered street numbered Big Lunch card. And, of course, a time to chate to the EBRRA committee informally regarding any concerns you have. We look forward to meeting as many residents as possible – so do please try to attend and have a nice day. Well done guys . . . you’ve come a long way. Thanks for that Sheila. All of the committee were determined that it would be a day of FUN FUN FUN and we think we pulled it off. WELL DONE EBRA MEMBERS ON A FANTASTIC AND MEMORABLE BIG LUNCH – DO WE REALLY HAVE TO WAIT UNTIL NEXT YEAR FOR ANOTHER ONE?